Catholina Lambert was born in the village of Goose Eye, England in 1834. The son of working class parents, Lambert came to America at the age of 17 to seek his fortune. He found that fortune in silk, and by 1890 he had become one of the largest mill owners in Paterson, New Jersey, the Silk City of the New World. 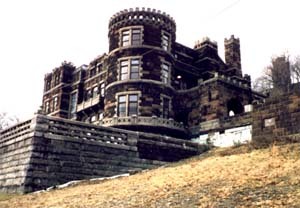 In 1892, Lambert built the castle, then known as "Belle Vista" on Garret Mountain overlooking Paterson. More than just a residence, the castle served as an elegant setting for his fine collection of European and American painting and sculpture. Mounting debts forced Lambert to mortgage his estate in 1914 and to sell a considerable portion of his vast art holdings in 1916. Despite this, Lambert managed to live comfortably at the castle until his death in 1923. After his death, his son Walter sold the castle to the city of Paterson. For several years, it was used as a fresh air camp for disadvantaged children, and in 1934 it was bought by the Passaic County Park Commission. 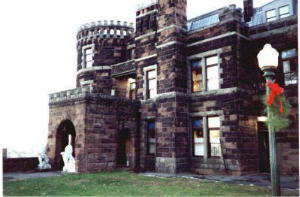 Today, Lambert castle serves as headquarters for both the Passaic County Park Department and the Passaic County Historical Society. The previous information courtesy of the Passaic County Historical Society. We visited the castle in January of 1999. They are doing renovations, and the finished work that I saw appeared to be very well done. The castle is not now open to the public. I was told that they expect to open it sometime in the year 2000. Lambert built his castle and later, Lambert's Tower. The tower sits atop Garret Mountain. He built it to enjoy the summer winds. My friends who had been to the top of the tower said it was magnificent. It faces the New York City skyline as does Lambert's Castle observation deck. On clear nights, the view from the Castle is absolutely exquisite. 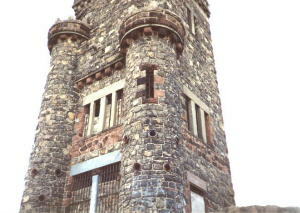 The tower used to be open to the public somewhere around 1975. They closed it off because the stairwell was in dire need of repair and the funds just weren't there. Lambert ran into financial problems later on in life. Now comes the myth/fairy tale. People say he owned a heap of marble statues and such and instead of letting the bank take it all, he buried some of the more valuable items throughout the Garret Mountain reserves. He died before he had a chance to recover them. Are they still up there? Perhaps. Lambert Castle has a new phone number for castle museum information: (973) 247-0085. Also, it is temporarily closed to the public while they paint the ceiling -- they expect it to reopen in late May 2001. My cousin was searching the web and found your site. She e-mailed me the site to inform me off one of my most favorite castles. I used to go to Lambert's Castle frequently when I was a teenager. When I got engaged my fiancee and I both visited and just "hung" out there. We were so infatuated with it's structure and beauty that we had our wedding photo's taken there. I moved to Arizona a few years after that . I came back home to New Jersey in 1996 to find out that it was being renovated. It is also known as a museum. It is now 2002 and it looks better than ever. It a must see if anyone ever visits New Jersey. Growing up in Cedar Grove, NJ, my dad took us to Garret Mountain and the tower many times.I remember climbing to the top, and the snack bar. My dad has a picture of me and my two brothers inside the hollow tree next to the tower, probably taken in 1955. I took my wife to NJ in April, 2002, and Garret Mountain was one of the places we visited. It's a little harder to fit into the hollow tree now. The overlook views Patterson and the old silk factory complex, which is now a museum. I was told by a cop that there are plans to renovate and reopen the tower and the snack bar. This is a wonderful place to visit. The Passaic County historical Society has a lot of pics and info on Lambert Castle at www.lambertcastle.org They previously did not allow weddings there, but the Society recently changed their policy to allow indoor and outdoor wedding ceremonies but not receptions. My fiancé and I are going to have our wedding there in September. First and third pictures courtesy of Robert Harney.